"When I was in Seville several years ago, one of the culinary highlights was a concoction of chickpeas and spinach served piping hot. I have tried to recreate it at home from memory but to no avail. Can you help?" Birgith Sims, Kingston-upon-Thames, Surrey. We went to Elisabeth Luard, author of The Food of Spain and Portugal (Kyle Cathie; £25), for a recipe. Elisabeth explains "this is a popular tapas dish: chickpeas flavoured with the basic Spanish sofrito - onion and garlic cooked in olive oil - then combined with greens." Wash the spinach and put in a pan with just the water that clings to its leaves and a little salt. Cover and put over a medium heat for a minute or two, until wilted. Drain well in a sieve, pressing out the water with your hands. Heat the oil in a heavy frying pan, add the onion and garlic and sprinkle with a little salt to encourage the juices to run. Fry gently for 20 minutes or so until the onion is soft and golden (don't let it brown). Sprinkle with the cumin and let it roast for a minute in the hot oil. 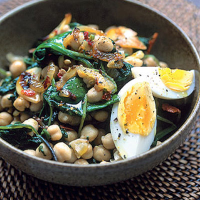 Stir in the drained chickpeas and the spinach and season. You can eat the dish like this, or sprinkle it with a little sherry vinegar. For a more substantial dish, finish with quartered hardboiled eggs. Eat with bread to mop up the juices.